Free RAR Extract Frog is a skinable extraction tool for RAR-archives that supports spanned archives as well as the decompression of password protected files. It comes with short instructions in 45 languages. Start the extraction of a RAR file by drag 'n' drop, double click or shell integrated context menu. To speed the decompression process up, Free RAR Extract Frog has the option to define a default output folder or a default password or both. ...... Change Free RAR Extract Frog's skin by simply dropping a JPG image on the image of the frog above the short instructions. 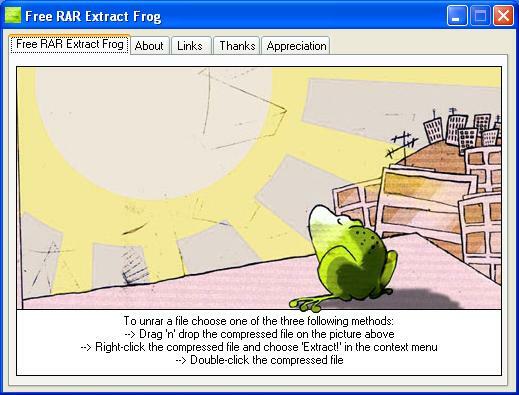 Change Free RAR Extract Frog's skin by simply dropping a JPG image on the image of the image above the short instructions. Not only is the RAR Extract Frog an excellent extraction tool for all archives that are in RAR format, Free RAR Extract Frog also can help support archives that are spanned and help you decompress any files that are password protected. The only thing you need to know how to do in order to use Free RAR Extract Frog is double click or how to drag and drop a file into the software's context menu. A powerful URL extractor utility. Extract URL with title, description, keywords. Extract all image and sound resources from any flash file conveniently. Extract data, including email addresses and URLs from your files and webpages. Extract links from files or webpages. Icon extractor tool to extract icon from exe. Free PDF creator, PDF writer and PDF converter for Windows NT4/2000/XP/2003. Extraction of device driver files directly from Windows OS. Qweas is providing links to Free RAR Extract Frog 4.70 as a courtesy, and makes no representations regarding Free RAR Extract Frog or any other applications or any information related thereto. Any questions, complaints or claims regarding this application Free RAR Extract Frog 4.70 must be directed to the appropriate software vendor. You may click the publisher link of Free RAR Extract Frog on the top of this page to get more details about the vendor.